The ecosign is a private and independent academy in Cologne-Ehrenfeld with a focus on sustainable design. We visited the ecosign to talk to Professor Karin-Simone Fuhs to find out more about the development of the academy since it was established in 1994. Nicolas Beucker teaches design at the Hochschule Niederrhein, University of Applied Sciences and pursues the issue of shaping the city as a habitat for society. Here he presents the content of his field of Social Urban Design. KnowMe stands for eco-fair clothing from Münster – for upcycling and recycling of discarded clothes as well as DIY workshops. We visited Noomi in her atelier in Münster. 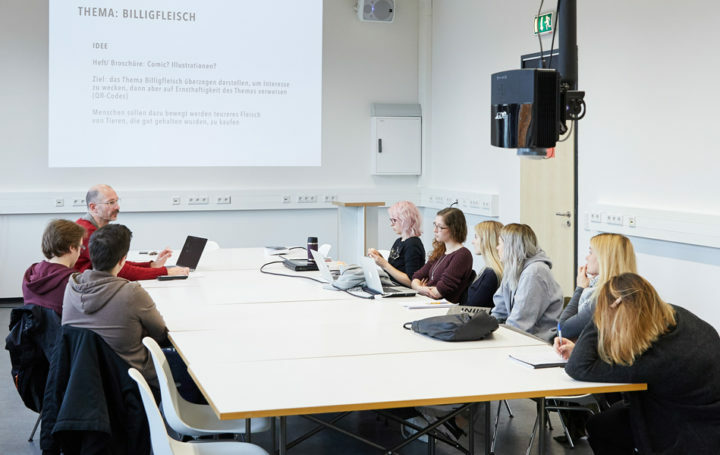 Design students at the University of Wuppertal and the Folkwang University of the Arts are participating in the contest “Lebensmittel sind mehr wert”, or “Food is valuable” and are designing sustainable media and product solutions. The project was initiated by the Consumer Direct of North Rhine-Westphalia. Ursula Tischner asks the provocative question: Change by design or by disaster? and talks about designers’ opportunities and responsibility with regards to the environment and society. Martin Weiß builds wooden surfboards for his label Backwood to foster sustainability in surfing. We visited him in his workshop in Aachen.